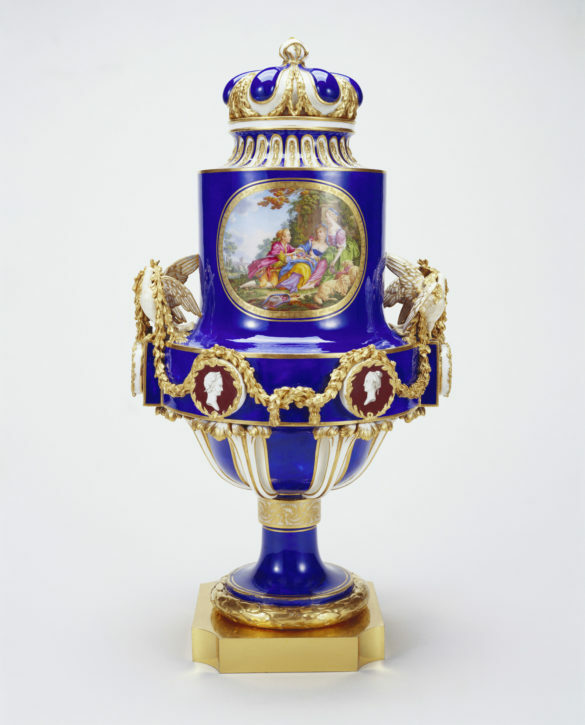 Vincennes and Sèvres porcelain is celebrated for its brilliant ground colours (couleurs de fond). These are the solid or monochrome background colours tinted with metallic oxides (for example, cobalt produces blue). They often have shaped panels left in white, known as the ‘reserve’, which are subsequently painted by factory artists. Each colour is described by its historic name, often based on references found in the factory sales archives. Many were the invention of the manufactory’s chemist Jean Hellot (1685–1766). There are also some wonderfully creative decorative ground patterns, such as fond Taillandier, marbré, mozaique, pointillé. This is all part of our French Porcelain Society language. The earliest ground colour used at Vincennes was blue, known as bleu lapis, a reference to the stone, lapis lazuli. It was introduced in 1751, probably to imitate Chinese powdered blue grounds. It is uneven and mottled as it was applied directly onto the unglazed body, with powdered cobalt added as a colourant, before glazing and firing. In the 1770s, it was known as ‘gros bleu’ (dark blue). Detail from a Vincennes cup (Gobelet litron), 1754. As early as 1751, the Vincennes factory records note ‘fond jaune’ to describe a variety of yellow grounds. A rich and even yellow ground was difficult to produce and earlier experimental attempts were very pale. 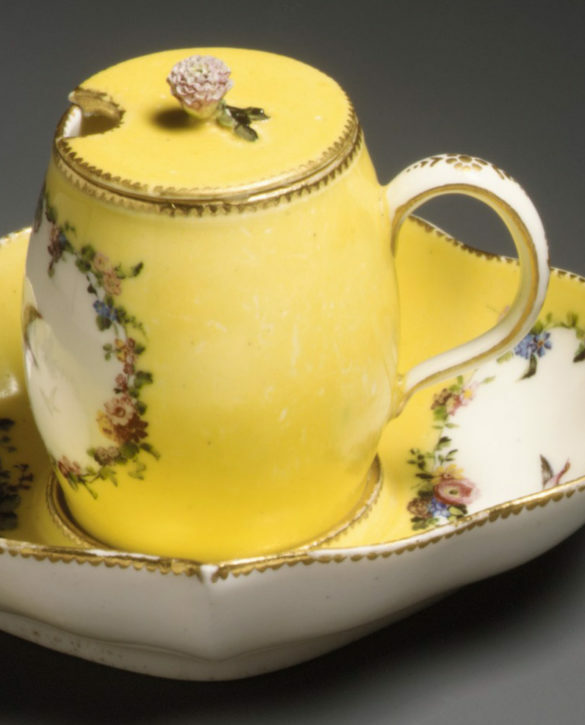 The inspiration was the yellow ground produced at the Saxon royal porcelain manufactory at Meissen. Vincennes mustard pot and stand (moutardier ordinaire), 1753. The much-admired turquoise-blue ground colour was introduced in 1753. The colorant is copper, rich in soda and potash, and cobalt. It was applied as a powder, sieved onto a tacky undercoat on the glaze, before firing. 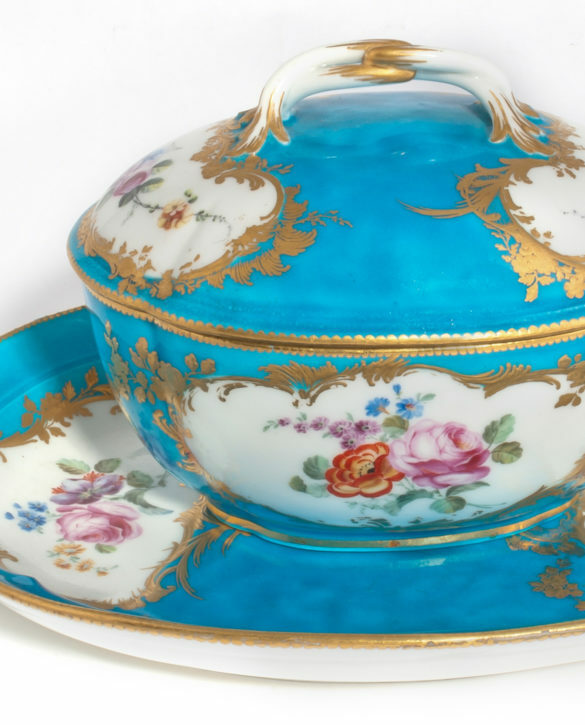 It was famously used on the Vincennes dinner service for Louis XV in 1753, where it was described as ‘bleu ancien’. 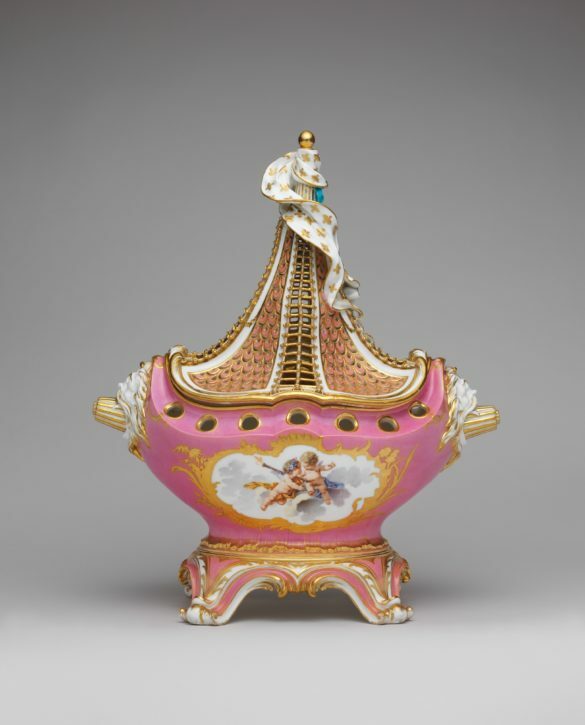 It was one of the most expensive colours ever used at the Sèvres manufactory and again imitates a Chinese glaze colour. Solid green grounds from copper oxide were not common until 1756, introduced shortly after the factory was moved from Vincennes to Sèvres. The earliest are slightly bluish but by 1757, greener. The records sometimes described it as ‘fond vert de Saxe’, paying homage to the green grounds used earlier at Meissen. The celebrated pink ground was first recorded as ‘fond rose’ in 1758. It was based on the colloidal suspension of very small solid particles of gold in the enamel glaze. The term ‘Rose Pompadour’ was coined in England in the 1760s but this was a crimson or claret colour not the French rose or pink with which Pompadour’s name later became linked. 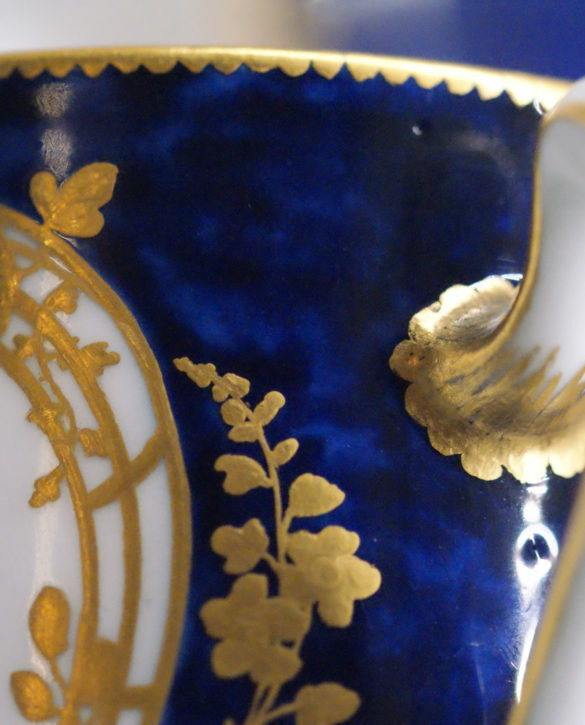 The popular solid dark-blue ground, applied over the glazed surface, was described as beau bleu from 1768; earlier, between 1763 and 1768, it was known as bleu nouveau. Again, the source of the blue was cobalt. The elegant fond noir is a blue-black pigment produced from iron and cobalt. 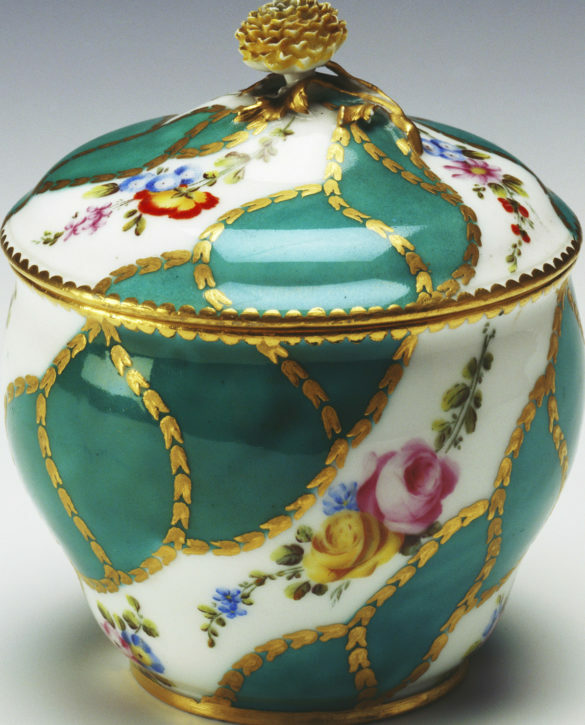 It is applied in thick layers in a technique developed at Sèvres for the new hard-paste body in the early 1780s. 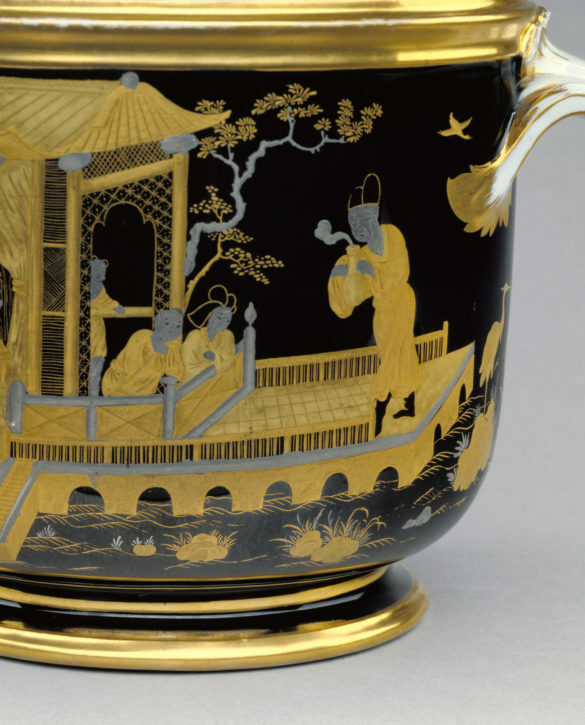 The colour imitated rare Chinese black-grounds (wujin) on porcelain, identified as ‘mirror black’ in the letters of Père François-Xavier d’Entrecolles (1664–1741), a French Jesuit who lived in China, and studied ceramic production.